Three friends set out to explore a remote area. They choose a safe place and make it their Base Camp. To speed up exploration time they decide to work independently. At any given point, either one or more of them can set out to explore the area. They set a protocol that after exploring the area they must meet back at the Base Camp in the evening and exchange notes. The remote area consists of accessible and inaccessible pieces of land. Being ordinary humans, they must walk only the accessible piece of land. In order to maximize their exploration time, each one is interested in knowing about a shortest path back to the base camp. Given that the area under exploration is arranged in form of a rectangular grid, help the explorers to chalk out a shortest path back to the base camp. Properties of a rectangle can be used as heuristic in computing distance between their positions and the Base Camp. Your task is to find out and mark the shortest path for each explorer and print each path as a separate grid. The input and output specification sections describe how inputs will be provided on console and how output is expected back on console. If there are more than one explorers, explorer with smallest value should be printed first in the output. Next smallest explorer location should be printed next followed by the last explorer grid. Note: - The output format shown above is for understanding purpose such that it highlights the shortest path between the explorer and the base camp. 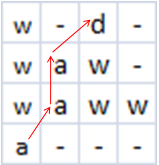 The examples in above table depicts output in text format as you will be required to provide. Please do not use package and namespace in your code. For object oriented languages your code should be written in one class. For C and C++, return type of main() function should be int.